Chicken and Andouille Gumbo | Om nom nom! Slice and cook sausage until browned – when finished, remove and drain on paper towels. Set aside. Time to make the roux! The most important part. 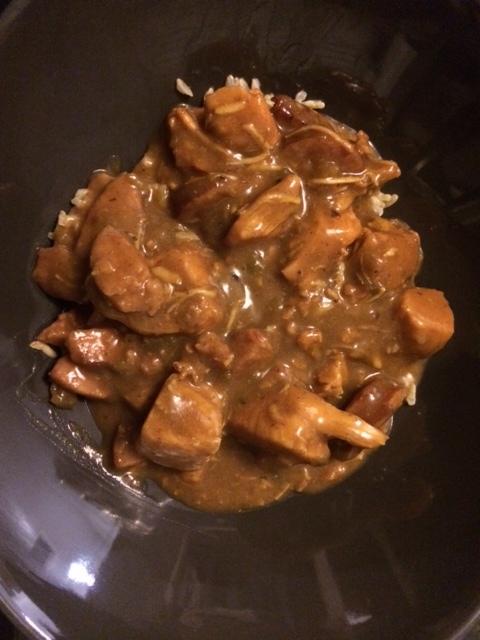 A Creole Gumbo has a lovely dark brown color that stems from the roux. Combine the 3/4 cup bacon grease and 1 cup flour in the same Dutch in which you browned the sausage and chicken. Cook, stirring slowly and constantly for 20-40 minutes, to make a dark brown roux, the color of chocolate. Do not stop stirring – roux will burn within seconds. You can stop at a light brown if you like a more Cajun gumbo. When roux is to your liking, add the onions, celery, and bell peppers and cook, stirring until softened. Add the reserved sausage, salt, cayenne, and bay leaves, stir, and cook for a few minutes, then (while continuously stirring), add stock until well combined. Bring to a boil, then reduce the heat to medium-low and cook, uncovered and stirring occasionally, for 1 hour. Add the reserved chicken to the pot and simmer for another our or so, skimming off any fat that rises to the surface. Remove and discard the bay leaves. Pull the chicken meat from the bones and shred, discarding the bones and skin. Return the meat to the gumbo and stir in the green onions, parsley, and file powder. Spoon rice into the bottom of deep bowls or large cups and ladle the gumbo on top. Serve, passing hot sauce on the side.